A host of stars turned out for the London premiere of Christopher Nolan's Batman epic this week including The Wanted, JLS, Pixie Lott and, of course, the film's cast themselves! 1. 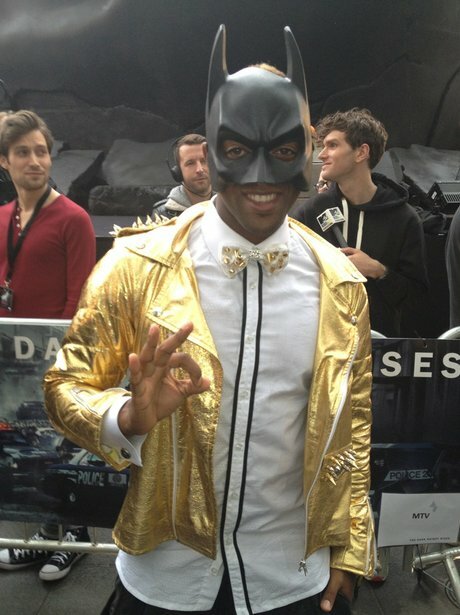 JLS star Oritse offers his best impression of the caped crusader at the premiere of the film. 3. The Wanted's Siva Kaneswaran dresses up in a tuxedo for the latest Batman film premiere. 4. The full cast of The Dark Knight Rises pose at the UK film premiere in London's Leicester Square. 6. Film star Anne Hathaway glows on the red carpet while celebrating her role as the antihero Catwoman. 7. The Wanted's Nathan Sykes dresses up while walking The Dark Knight Rises red carpet. 8. Stars Christian Bale and Tom Hardy pose for the cameras at the second UK premiere in Waterloo. 10. The Dark Knight Rises stars Christian Bale, Tom Hardy and Anne Hathaway at the UK premiere. 11. JLS star JB Gill smiles for the cameras with his girlfriend while walking the red carpet last night. 12. Pixie Lott steps out in a sweeping blue gown for the star-studded Batman film premiere this week. 13. Oritse Williams poses in a striking gold jacket at the Leicester Square film premiere. 14. Tom Hardy, who plays the film's villain Bane, signs autographs for fans at the UK premiere. 15. 'All About Tonight' singer Pixie Lott is all smiles at the 'The Dark Kinght Rises' UK premiere. 16. Anne Hathaway shows off her short hair do outside the Odeon cinema at the new Batman premiere. 17. N-Dubz star Fazer attends the Batman film premiere ahead of launching his debut solo single.